Provide comfort for the family of Cynthia Hunter with a meaningful gesture of sympathy. 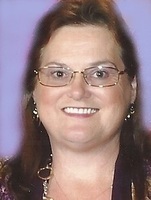 Cynthia Gayla Hunter, age 55 of Paisley, FL, passed away on March 30, 2019 surrounded by her loving family and friends. She was born in Jacksonville, FL on September 9, 1963 and was preceded in death by her father, Lester “Butch” Schuman and brother George David Ayers. She is survived by her Husband: Herbert ‘Barry’ Hunter III; Daughter: Kayla (Julius) Hoisington; Sons: Ray (Danielle) McKelvin and Nick McKelvin; Mother: Florence Moore; Siblings: Sonya (Perry) Soniat; Corky (Tricia) Ayers; Annette (Mitch) Watson; Ronald (Michele) Ayers and a host of grandchildren, nieces, nephews and friends. Gayla was a devoted and loving wife, mother and friend to all. She enjoyed sewing, quilting and spending time with her family, friends and Church congregation. She will be dearly missed by all that had the privilege and pleasure of knowing her and being a part of her life. A Celebration of Life Memorial Service will be held on Saturday, April 13th at 2:00pm at The Church at Whistling Pines in Umatilla, FL. Arrangements being handled by Beyers Funeral Home in Umatilla, FL. In lieu of flowers, please send donations, “In Memory of Gayla Hunter” to The Church at Whistling Pines, 16311 Whistling Pines Rd., Umatilla, FL 32784. The Family would like to say a special thank you to all the loving caregivers, and to her church family at The Church at Whistling Pines for all the love and support during her illness and this difficult time. To send flowers in memory of Cynthia Gayla Hunter, please visit our Heartfelt Sympathies Store. Provide comfort for the family of Cynthia Gayla Hunter by sending flowers. My heartfelt sympathy goes out to the family. I met Gayla at her very tender age of 6. Memories of her will remain her sweet smile and loving heart. Although there were years that separated us, whenever our paths crossed, the hugs were genuine the talks were dear. She was truly a lady gifted with a tender spirit. My prayers are with the family during this time of Gayla's passing into her Eternal life with Jesus. May the family of Cynthia Gayla Hunter please accept my sincere condolences hoping you find comfort in God's words at Acts 24:15 and Psalm 37:29.